Air Niugini will be implementing in-house “C” Checks, or heavy maintenance checks, on its jet aircraft in the country at the airline’s engineering hangar in Port Moresby, commencing on Monday 09th July, 2018. The airline’s Acting Chief Executive Officer, Mr Tahawar Durrani said it’s a milestone achievement for ANG to carry out heavy maintenance checks on its Fokker 100 and 70 aircraft onshore, adding that the arrangement would save the airline almost K2.5million each time an aircraft goes in for heavy maintenance. Previously, an aircraft had to be sent overseas for such maintenance, which is very expensive for the airline and the country. Mr Durrani said apart from cost savings, the in-house arrangement will also result in improved facilities and capacity building in terms of local knowledge and up-skilling of maintenance staff especially our young PNG Aircraft Maintenance Engineers who are coming through the ranks after years of extensive training. The PNG Civil Aviation Safety Authority has to give its approval to any organization performing maintenance on PNG registered aircraft, and Air Niugini has secured that approval. Air Niugini’s General Manager, Aircraft Maintenance Organization, Mr Benedict Oraka said a ‘C’ check or Heavy Maintenance Check on Fokker are done after a certain period of time and interval, flight Hours and maybe carried out after every two to three years while an “A” and “B” checks are lighter checks and are done very every two to six months. He said the duration of the maintenance also depends on the amount of work that needs to be done, some may take three months to complete whilst others up to five months. “Our team is all set and motivated to do this heavy maintenance / refurbishing work including installation of new business class seats on the Jet aircraft.” Mr Oraka said. The Chairman of Air Niugini, Sir Frederick Reiher, said the implementation of in-country heavy maintenance checks was an outstanding achievement by the management and technical support team of Air Niugini and delivered on a commitment the board had undertaken to deliver. “The board is proud of this significant achievement,” Sir Frederick said. 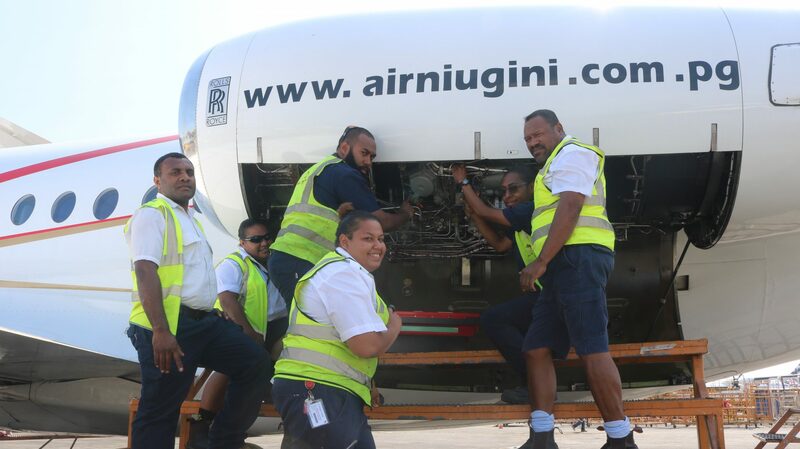 Apart from the jet aircraft, Air Niugini has recently completed in-house heavy maintenance checks successfully on two prop DHC-8-300 aircraft – the first one last year with the second major check at the beginning of this year.